I have forgotten my password. What to do? Originally founded as a stockist, distribtor and wholesaler of Massey Ferguson Tractor Parts, Mian Autos quickly moved into the manufacturing area, producing Engine Parts, Body Parts, Seats, Fenders & Emblem Parts, Clutch and Electrical Parts, etc. 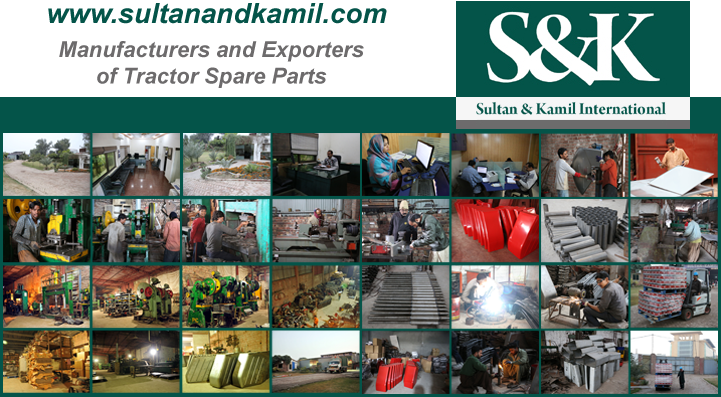 The manufacturing division of Mian Autos is known as Sultan and Kamil International. We would like to give you a brief overview of our manufacturing divions as below. "Our business is based on quality, reputation, customer service and performance. The highest emphasis is placed on human resources and deployment of the latest in information technology. We are eager to achieve the maximum level of customer satisfaction as well as committed to quick delivery and services. We believe in the use of technology in our manufacturing processes to ensure the production of goods of international standards at the most competitive prices." Mian Autos is exporting its products almost in all the continents of the world. We have a large portfolio of satisfied customers and we are looking to expand more in to the world marketing by making products upto international standards. © 2002 - 2011. Mian Autos. Mian Autos is registered company in Pakistan. Registered Office: 57 Badami Bagh, Lahore, Pakistan. Mian Autos is one of the leading manufacturers and exporters of automotive, agricultural components and tractor spare parts for the last 50 years. The Organisation is 100% export oriented having highly qualified staff at its back having experience of nearly 15 years in the manufacturing process and maintaining quality tools to the International standards and specifications. Our belief in the business ethics of passing on the cost benefits to the customer has enabled us creating a wide export market. Our constant research and development towards attaining highest possible quality standards at most nominal prices has made us competent to challenge anybody about the fact that our prices are lowest in terms of quality we offer. Customer Enthusiasm has been our main motto. All our politics and programs are aims at customer satisfaction.